If you've been reading my blog lately you know how much I LOVE my crock pot and have been trying it for all kinds of new and inventive recipes. I have been trying a lot of desserts in it lately and love that they slowly simmer during the day making my house smell A-MAZ-ING! This time I tried a old favorite; Apple Crisp. I was not disappointed either. It was super easy to throw together and just as tasty as an oven baked crisp. I have also been using red apples in my baking lately; gasp! I have always been a Granny Smith girl but found, through recipe testing from others, that Fuji and Gala are delicious to bake with. I will be using them from now on. So when it's cold and blustery outside, just pop an Apple Crisp into your crock pot and dessert is ready when dinner is done. Apple Crisp is the perfect Fall dessert. Wash, peel, and thinly slice the apples. Place in a bowl and toss with the sugar, cinnamon, nutmeg, and flour. Pour into the crock pot. In the same bowl you used for the apples (no reason to dirty another one) place the oats, sugars, and spices for the topping. Stir together and add the cold butter. Using a pastry blender or your fingers blend until it forms little pea sized balls. Pour evenly over the apples and cover with lid. Cook on low for 3-4 hours, until the apples are fork tender and the topping is cooked. Be careful when lifting the lid so that all the condensation doesn't end up on top of your crisp. I removed my lid once an hour and wiped it off. OMG! I bet that makes the house smell amazing! I've never cooked a dessert in the crockpot. I'd love to try this! Crock Pot desserts are amazingly easy and you're right the whole house does smell amazing :) Thanks for stopping by. looks yummy, I can't wait to try it! Mmm looks great! Would love it if you linked up on my blog hop www.w-t-fab.com/search/label/bloghop. Also let me know if you'd like to follow each other! This looks really yummy. I just bought some apples to try a cobbler in my new crock pot lol. Great minds think alike. Found you at Whatch Work Up. Oh my goodness does this look delicious. I think I can actually smell it from here! (I love my crockpot too) Thanks for sharing on Tout It Tuesday! Hope to see you next week. This is a great recipe to take to a covered dish, it looks delicious! Hope you are having a great weekend and thank you so much for sharing with Full Plate Thursday. This looks amazing. I'm sure the apples become so delicious after cooking slow in the crock pot! Thanks again for sharing on FFF. 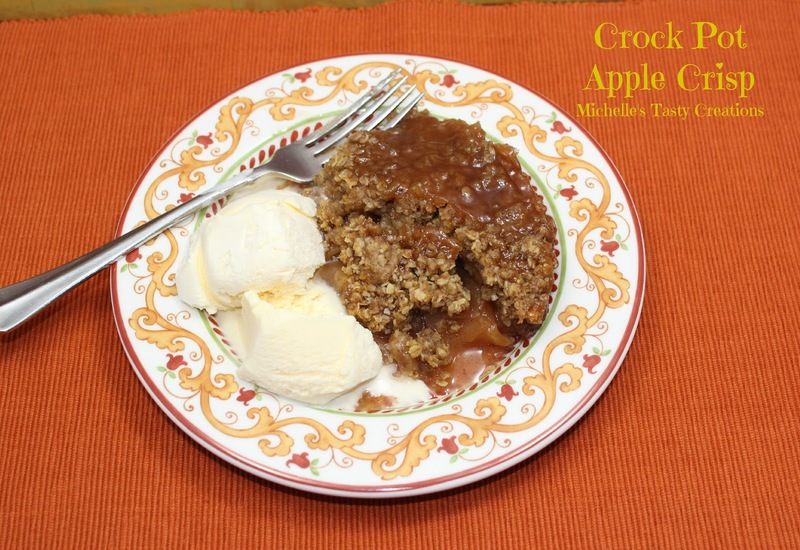 I love crockpot apple crisp; your recipe looks awesome. I'm going to have to compare it to the one I have! Thanks for sharing this week on Saturday Show & Tell on Cheerios and Lattes! We love having you! :) Have a great week! Sounds delicious! Thanks for sharing with Foodie Friends Friday! What a great recipe. It looks awesome! Oh my, that looks delicious! I finally gotta talk my husband into buying me a crockpot!